Nicole Osmar, 15, says her family has been mushing “forever.” She is a second generation Jr. Iditarod musher and third generation musher. Her dad, Tim, is the Jr. Iditarod’s only three-time winner, and her grandfather, Dean, has won the Iditarod. 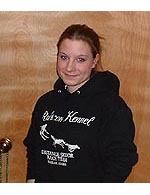 Nicole finished 10th in her rookie Jr. Iditarod last year. She says her family commercial fishes in Cook Inlet in the summer and mushes in the winter in the Caribou Hills. She helps support her dog team by raising 4-H animals, such as hogs and sheep. Nicole is a freshman at Ninilchik High School where she participates in trace. She says she also enjoys skiing, snow machining and snowboarding. She plans to attend college and says she will continue mushing.